I've been wanting to share my collection of The Grisha Trilogy by Leigh Bardugo for a while now. And today I'm finally doing so, hih. <3 It is pretty big. At least, I think so. And I love it all so much. Though I do wish it was even bigger :D And my collection will grow A LOT in June.. heh. More about that below all the pictures. And there will be a lot of pictures. So if you want to see them bigger, just click on them :) I have a lot of the books. A little bit of swag. And a lot of gorgeous jewelry that I bought from Hebel Design. <3 It is the best. Sigh. Also. I very much love these books by Leigh Bardugo. Ruin and Rising cannot get here fast enough. <3 And I adore Leigh as well. She's the best :) Hope you all enjoy this. And then, my swag. Parts of it. <3 Jewelry to come. And another picture of the swag below, which you should make bigger, so that you can see my gorgeous wall better, hih. This is above my bed. And I love it all so much. My signed Shadow and Bone poster of Ravka. <3 It is so gorgeous. My perfect Siege and Storm bookmarks. DIES. Only have two. And they are so damn special to me. And my note from Leigh. Sniffs. It is so perfect. Thank you, Leigh. <3 And my bookmarks from Hebel Design. I need more. But these are so pretty. Sigh. I love them so much. And my keychains from Hebel Design as well, which needed to go up on my wall, hih. And my buttons. Agh. They are so pretty. And then there are those two gorgeous notes from the UK publisher, Indigo, aka Nina. <3 Who is the best. I love being a part of the Grisha Army. And the Mal-entines card.. It is THE BEST. Close up below ;p Which you can click bigger. I will not go on about my love for these books. As I have done so in all of my reviews. Which are many, lol. But I will talk a little bit. I love these books so much. I just think they are unigue and exciting and just all kinds of amazing. I love reading about Alina. She's adorable. But mostly I love reading about Mal. He is my love. And you have no idea how much it breaks my heart to see people dislike him after Siege and Storm. I don't get it. Mal did nothing wrong in that book. He was hurt. I was hurt. I would have behaved the same, probably. But I won't get into that, since I have talked so much about it these days in the Grisha Re-Read discussion posts on goodreads, hih. Which I am loving, by the way. There is just so much to talk about when it comes to these books. I ship Malina so much. Just so you know. And I cannot wait for Ruin and Rising. <3 I have high hopes for that book. Along with a lot of dread, as I don't know how it will end. I worry too much. But I am beyond excited as well. June cannot get here fast enough. Anyway. 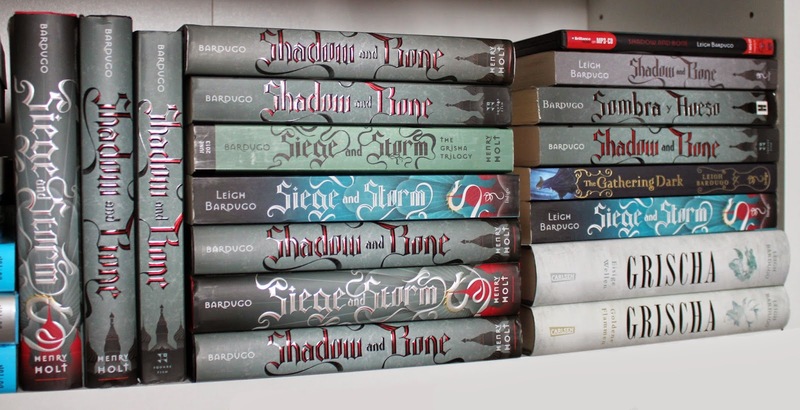 I hope you have enjoyed seeing my Grisha Trilogy collection :) I'm excited for it to get bigger. Shadow and Bone. Siege and Storm. Ruin and Rising. Leigh Bardugo. The Book Depository. My blog posts about The Grisha Trilogy. Shadow and Bone: Movie News! Wow, what an impressive collections! All the books are so gorgeous!! And the map is amazing!! I love it! That jewelry is gorgeous and I think I need to get me some! Hebel Designs is awesome! 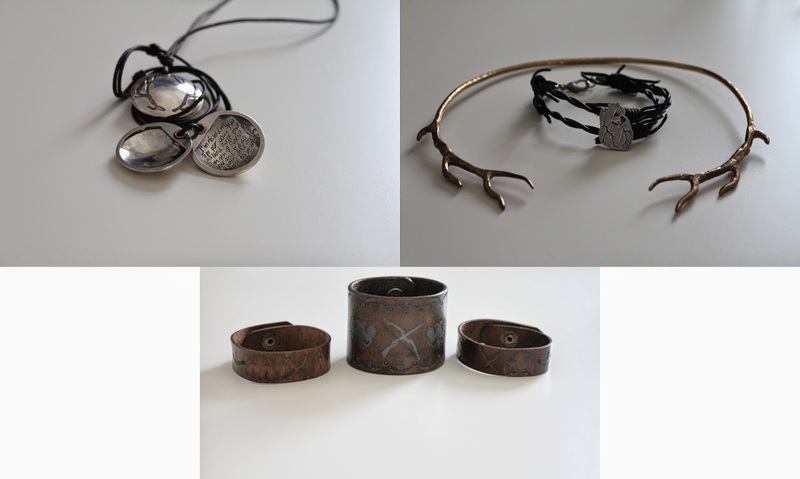 That is a seriously awesome collection, I want that antler necklace so bad! Jealous! Awesome collection! So jealous of the copy with the title "Gathering Dark" so unique :-) Enjoy them and I can't wait to see the pics after Ruin and Rising releases. 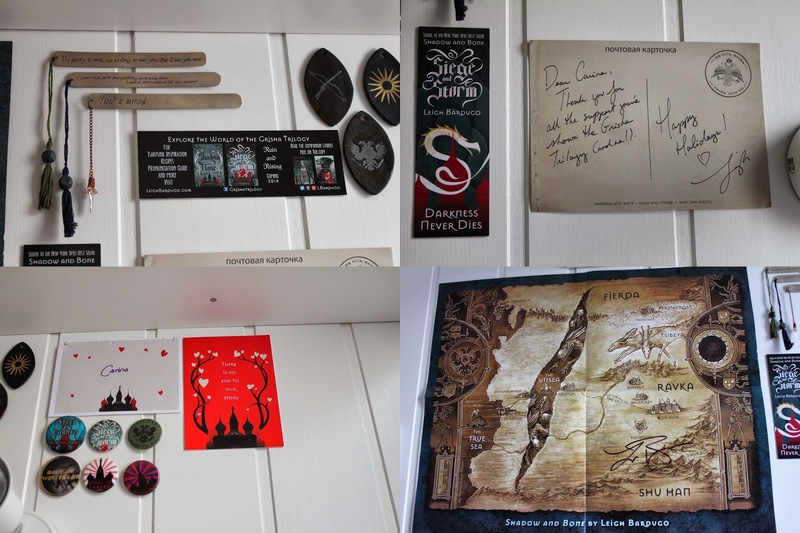 Wow, what an incredible collection, Carina! You can't see me right now, but I have hearts in my eyes!! I'm sooo totally in love will all your swag and beautiful jewelry! And a little jealous. I may have to indulge in some purchases from Hebel Design, heh. I also really love your enthusiasm for the series because I absolutely adore it (and Mal), too!! lol, thank you sweetie :D AND YAY. Another Mal fan <33 That makes me so happy. Sigh :) And ohh. You must buy from Hebel Design :D So much amazing. *rolls on floor* *faints* *dies* OMG IT IS PERFECT!!!!!! I will not comment on HOW MANY BOOKS YOU GOT BECAUSE HOLY! but omg THE SWAG <3 and.. THE JEWELRY!! AAAAAH! I need the special edition of Ruin & Rising so badly! Will see if Indigo has something like that, like they did for Allegiant. SO PERFECT CARINA! AAAH!! Oh my gosh, Carina, loving the swag! I am a big fan of Mal, too. :D Lets hope they end up together in R & R. If not, I will be a sobbing mess. The map / swag / jewelry!! So fabulous. This trilogy is incredible!